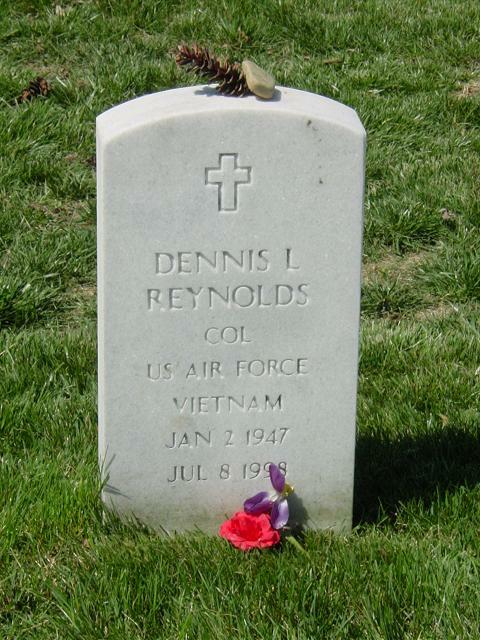 Dennis L. Reynolds, 51, a retired Air Force colonel who was a heavily decorated combat veteran of the war in Vietnam, died July 8, 1998at Walter Reed Army Medical Center in Washington. He had cancer. Colonel Reynolds, who lived in Woodbridge, Virginia, was a native of New Haven, Connecticut. He was commissioned in the Air Force after graduating in 1968 from the University of Connecticut. After flight training, he went to Da Nang, Vietnam, as a weapons systems officer aboard F-4 "Phantom" jets and flew more than 200 combat missions. He later served as a weapons systems officers instructor and served in Korea and Britain, as well as in the United States. His last assignment, before retiring from active duty in 1995, was at the Defense Logistics Agency headquarters at Fort Belvoir. There, he was deputy director of the base realignment and closure team. Colonel Reynold's decorations included two awards of the Legion of Merit, two Distinguished Flying Crosses, six awards of the Meritorious Service Medal and 14 Air Medals. He was the recipient of a master's degree in urban planning from the University of Nebraska and another master's degree, in business administration, from Strayer College. After retiring from the Air Force, he had been active in volunteer activities. He had served as volunteer coordinator for Prince William Social Services, and as a volunteer with the Manassas Battlefield Park and the Smithsonian Institution's National Air and Space Museum. He also had been a member of the 7th Regiment Virginia Volunteers Civil War reenactment group. Survivors include his wife, Gail, of Woodbridge; a son, Dennis P., of Kensington; a daughter, Alison H. Reynolds of Hoboken, N.J.; his mother, Marion C. Reynolds of New Haven, Conn.; a brother, Gerald, of East Haven, Conn.; and two sisters, Pamela Reynolds of Lee, Mass., and Beth Danziger of Newton, Conn.
On Wednesday, July 8, 1998 at Walter Reed Army Hospital, DENNIS L. REYNOLDS of Woodbridge, VA, husband of Gail Reynolds; father of Alison H. and Dennis P. Reynolds; son of Marion C. Reynolds; brother of Pamela Reynolds, Beth Danziger and Gerald Reynolds. Funeral services, with full military honors, on Monday, July 27, 1998 at 8:45 a.m. at Fort Myer Chapel. Interment Arlington National Cemetery. In lieu of flowers, contributions to The Leukemia Society, 2101 Executive Blvd., Box 21, Hampton, VA 13666.